While the debate is still open in the realm of basketball, football and hockey, it's generally accepted within baseball circles that the 1927 New York Yankees are the greatest team of all-time. Coined "Murderer's Row" for their lineup of exceptional hitters, you can take a quick trip down the batting order and it's pretty easy to see how the nickname came about. 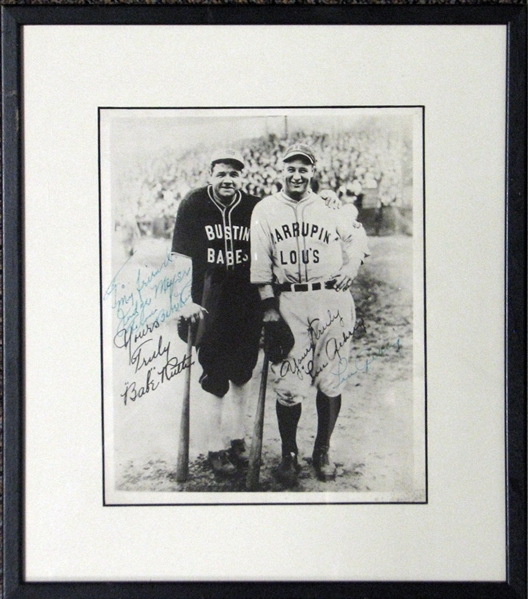 If you can somehow keep Hall of Fame leadoff hitter Earl Combs and shortstop Mark Koenig off the basepaths to minimize the damage likely to come from Babe Ruth and Lou Gehrig, you still don't get to breath easy as Bob Meusel and his .337 batting average comes at you next, followed by Hall of Fame second baseman Tony Lazzeri, who posted a .309 average with 18 homers and 102 ribbies in the sixth spot, and so on. While the Yankees were certainly a national attraction, people in the west half of the country were denied the opportunity to see Ruth, Gehrig and many other diamond greats in person. 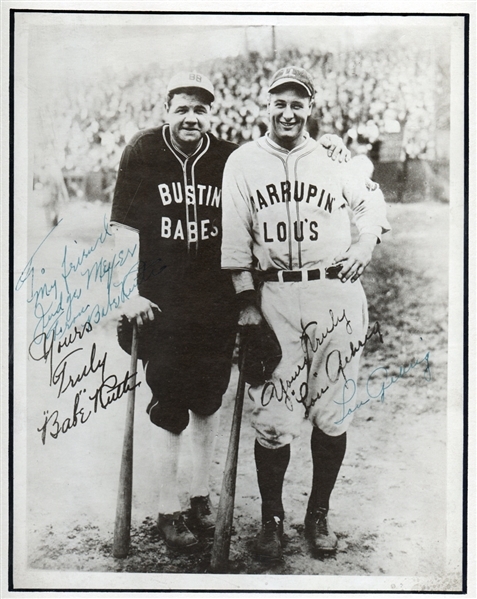 Realizing a lucrative opportunity existed once all the teams had packed it in for the winter, business manager Christy Walsh took the home run smashing duo and a troupe of baseball greats on a nine state tour where Ruth and Gehrig could astonish fans and display their herculean abilities in baseball exhibitions, with Gehrig captaining the "Larrupin' Lou's" and Ruth playing the frontman for the "Bustin' Babes." The tour consisted of 21 games with Gehrig earning more money in those three weeks than he did all season with the Yankees. 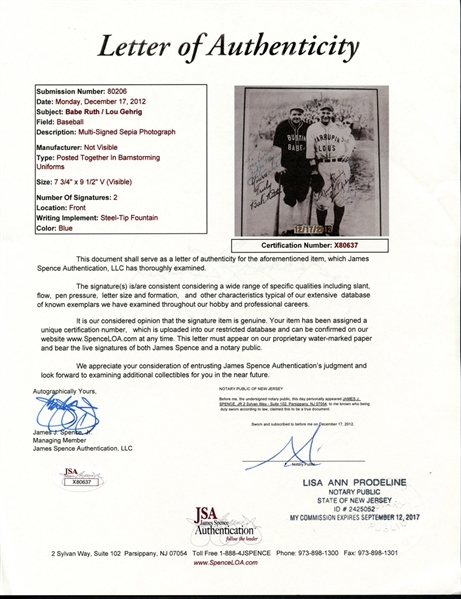 Photos with facsimile signatures of the Yankee teammates turned rival captains were available for purchase by spectators and a few lucky onlookers even managed to have the duo add actual signatures to the surface, but we've yet to come across one that can best this incredible piece. The presented photo is signed by both legends with each signature individually as well as the piece overall graded MINT 9 by PSA/DNA. 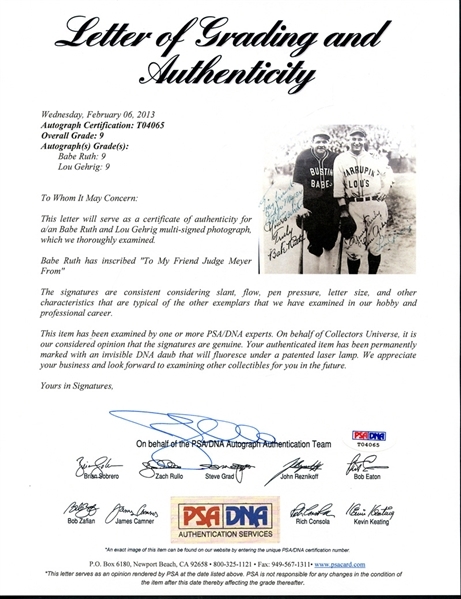 The large majority of photos like this are signed by Ruth in Gehrig in black ink, which tends to blend with the facsimile signature and can be confusing, but not here. Signed in green ink, the genuine signatures of Ruth and Gehrig are easy to read, with Ruth adding an inscription that reads, "To my friend Judge Meyer." Matted and framed, the piece measures 12 1/2" x 14" and is likely the finest autographed example of Ruth and Gehrig from their famous barnstorming tour. LOAs from PSA/DNA and JSA.